place in one of the towers here." This quote by a single NBC reporter is so ubiquitous and so central to the conspiracists' claims that, if you do a Google search for "Turi, Dawson, 9/11" you'll bring up hundreds of hits--almost all of them conspiracist web sites. The usual chicanery that passes for analysis of the issue holds that Turi's alleged statement, plus the real and genuine reports of numerous WTC survivors who reported hearing "explosions" in the towers after the plane strikes and before the tower collapses, is a convincing case of "controlled demolition." Alex Jones uses these claims as a central tenet of his film 9/11 Martial Law: Rise of the Police State, and his web site, www.prisonplanet.com, which is a home base for many net-based conspiracists. Time and time again I've had conspiracists direct me to these quotes and videos and then claim victory, that it is conclusive proof of a 9/11 conspiracy. This belief is, to say the least, misplaced. In fact, the Turi quote and "bombs in the towers" testimony is nothing more than smoke and mirrors--here's why. 1. What did Albert Turi actually say? If you pick apart what the conspiracists are actually relying on--and what little we know about what Albert Turi actually said--it's evident that the Turi quote is a very slender hook upon which to hang a massive conspiracy theory. First of all, Turi's statement comes to us through Dawson's report. Try this: do a Google search for "Albert Turi," as a phrase. Today I brought up 632 hits. Now try "'Albert Turi' -Dawson" (go to the Advanced Search page and look for "Albert Turi" but exclude pages containing the word "Dawson"). I got 156 hits. This off-the-cuffand unscientific analysis shows that 76% of the time his name is mentioned on Google-searchable engines, Turi's name appears in conjunction with Dawson's. Even most of the 24% of the remaining hits that I sampled randomly make reference to Turi in conjunction with being quoted--but never a direct quote. This demonstrates that, overwhelmingly, Turi's "testimony" comes from a single statement, made to a single reporter (Dawson), who did not even quote him directly. The conspiracists are thus relying not on what Turi said--or even what they think Turi said--but what they think Pat Dawson thought Turi said, on one occasion, on one channel, once. "The next thing I heard was Pete say what the f*ck is this? And as my eyes traveled up the building, and I was looking at the south tower, somewhere about halfway up, my initial reaction was there was a secondary explosion, and the entire floor area, a ring right around the building blew out. I later realized that the building had started to collapse already and this was the air being compressed and that is the floor that let go. And as my eyes traveled further up the building, I realized that this building was collapsing and I turned around and most everybody was ahead of me running for the garage, and I remember thinking I looked at this thing a little bit too long and I might not make this garage. But I did." There you have it--Turi in his own words. "My initial reaction." And the crucial qualifier: "I later realized that the building had started to collapse already." This is the great hook upon which hangs the conspiracists' claims of controlled demolition. If you read the full interview, you'll see that nowhere does Albert Turi ever make the allegation that there were bombs in the World Trade Center. Nor is his story inconsistent with what he appears to have told Pat Dawson. If he was reporting his initial reaction to Dawson, that would fit squarely with his interview on October 23, 2001. 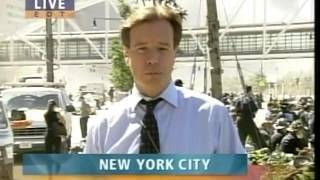 Ignoring the obvious question--why do the conspiracists trust an NBC reporter, Pat Dawson, to quote Turi accurately--it becomes even more bizarre when you realize that Turi was not even talking about controlled demolition, nor does he seem to have had that feeling on the morning of 9/11. "And as my eyes traveled up the building, and I was looking at the south tower, somewhere about halfway up, my initial reaction was there was a secondary explosion, and the entire floor area, a ring right around the building blew out." But you can see from my own more expansive quote from the interview (click here to read it again if you need to), Turi did not say that--the crucial words "I realized that the building had started to collapse already" have been carefully excised. Why is 911review.com playing spurious games with quotes? Could it be because Turi's "testimony" is at the very center of the controlled demolition claim, and to reveal that he doesn't seem to support that view would be to strike at one of the very sacred cows of the 9/11 conspiracist movement? 2. Why hasn't Turi spoken up more forcefully? As you can see from my own investigation of Turi's presence on the web, Mr. Turi himself has evidently not exerted himself to any great degree to clarify or reinforce his comment to Mr. Dawson on the morning of 9/11/01. I had to search pretty hard to find the full McCourt-Turi interview, and recognizing it among the chaff of the oft-repeated Dawson story was a tedious task. Why hasn't Mr. Turi spoken up--either to clarify that he did mean to suggest there were bombs in the WTC towers, or that he did not mean that at all? The conspiracists will likely attribute Mr. Turi's reluctance to come forward to sinister motives: Alex Jones, in fact, in 9/11 Martial Law makes the claim (which he does not substantiate) that firefighters' comments about "controlled demolition" have been suppressed by some shadowy arm of officialdom. This, however, is speculation, not fact. If Turi did believe in the "controlled demolition" theory, and the powers-that-be wanted to suppress him, why then was he allowed to be interviewed by Mr. McCourt, and why was the transcript of that interview published by the New York Times? There is not a shred of evidence that Mr. Turi has been threatened or otherwise silenced--in the absence of any such hard evidence, a claim of "official suppression" only makes sense if you already believe there is a conspiracy. Since belief in the conspiracy departs largely from the Turi misquote in the first place, this strikes me as an example of circular reasoning. From what limited information I was able to gather about him on the web, Mr. Turi is now retired from public service. I have no doubt that he has probably received hundreds of letters from conspiracy researchers asking him to elaborate on his statements to Mr. Dawson. If he's one of their golden boys, surely somebody has tried to get him to go on record to support their case. It seems fair to guess that if Mr. Turi had ever granted an interview or public statement to a researcher on this matter, and his response supported the notion that his comment to Mr. Dawson meant that he was talking specifically about controlled demolition, you would find that statement commanding prominent attention on sites like www.prisonplanet.com. I wish to ask the conspiracists, then, if it is at least possible that maybe he has declined to answer any such queries because he doesn't want to bother feeding speculation, and that he said everything he had to say to Mr. McCourt in October 2001? To the extent we can or should read anything into Mr. Turi's low profile, is this not at least as fair a guess as the "suppression" claim? 3. What about all that other "explosion" testimony? The conspiracists' love "explosion" stories, and the fervor with which they've repeated and misattributed Turi's alleged quote to Pat Dawson seems to bear this out. I would not be surprised if a criticism of this blog turns out to be, "Well, what about all those other witnesses who claim to have heard 'explosions' prior to the towers' collapse?" I am, in fact, preparing a separate blog on that very subject, but in a nutshell the argument is this: how do you know that these witness reports are inconsistent with the "official story"? Let's assume Mr. Turi did hear what he thought was an explosion in the South Tower before its collapse, and that he intended to convey that message to Mr. Dawson. Under the circumstances that were then occurring in the burning and almost-ready-to-collapse South Tower, is it logical to maintain that the only possible source of any sound that could be described as an "explosion" is, in fact, a demolition charge? This is the fatal error, isn't it? The conspiracists wish us to believe that there is no possibility that a 1000+ ft burning skyscraper, which has been struck by a jetliner and has been raked by fire and damage up and down its height (particularly through the elevator shafts), is an environment in which either (a) explosions cannot actually occur from some cause other than demolition charges, and (b) that no other sounds can occur which witnesses can reliably describe as "explosions." In fact, the "explosion" testimony is incredibly consistent--witnesses say over and over again "I heard an explosion" or "it sounded like an explosion" or "it sounded like a bomb went off." Indeed, if you heard a big bang in a tall building, how else would you describe what it sounded like? If the towers were standing still--if they had not been struck by airplanes, if they were structurally stable and there were no fires or other structural traumas to the buildings--it would be eminently logical to assume than an explosion-like sound may come from a bomb or some other explosive device. But the towers were not standing still. They had been struck by planes. They were on fire. Debris was collapsing from the top, both internally and externally. Their structural integrity was in serious question--as Turi's full October interview shows was very apparent. The conspiracists insist that, even under these extreme conditions, an explosion (or any sound that witnesses can interpret as an explosion) would not have occurred--but they do not explain why, because they can't. When you make the error of assuming that, for purposes of determining the likely cause of an explosion, a burning structurally-unsound skyscraper is the same as a building to which there has been no such trauma, it's easy to conclude that the "explosion" testimony can point to nothing but controlled demolition. This is the mistake every believer in the controlled demolition theory has made--and the mistake that few of them realize they've made. This will be covered in more depth in a future blog. Albert Turi is not the spokesman for a conspiracy; while we may never know, it seems likely that he does not believe there was a conspiracy to blow up the World Trade Centers. Yet it's likely he will remain prominent in 9/11 conspiracy lore for years to come. As usual I expect to make no converts with this blog, and I may likely make even more enemies. But it seems to me that somebody should be standing up to protest how grotesequely this man's words have been twisted to serve as support for a bizarre adventure into the netherwords of illogic and paranoia. Mr. Turi, my hats off to you, and thank you for your service to New York and the nation.